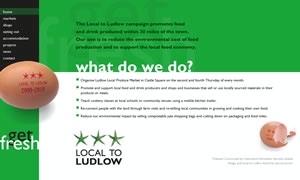 The Local to Ludlow web site is designed to help people buy local products and support sustainable small scale farming and businesses which contribute to conserving and enhancing the environment. The database is held on an MS SQL server which is backed up every night. The web site makes extensive use of Google Maps including providing directions to suppliers and even working out which suppliers are in the local area around your own postcode.